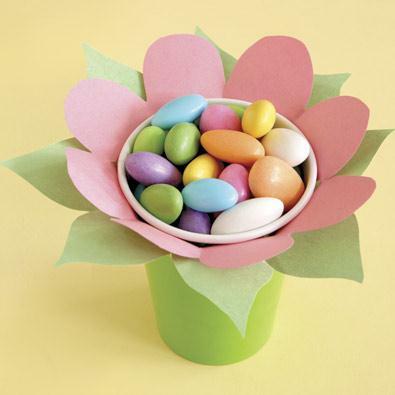 Adding creatively arranged flowers or handmade centerpieces along with colourful easter eggs of Easter decor will make your home and your festive dinner table more appealing – and it doesn’t have to be difficult. Here are a couple of my favourites to give you an idea or two – do not be afraid to get creative, use your favourite flowers and enjoy your holiday! Trace the mouth of a paper cup onto paper. Draw petals around the circle you traced; each petal should be about 2 inches long. Trace this flower shape onto coloured paper and cut it out. Pierce the center of the flower with a pencil. Cut triangles from this center hole out toward the petal, making sure to stop about an inch from the edge. Slide the flower over the cup so that it comes up to the rim. Cut off the excess paper at the tips of the triangles, then tape the base to the cup. Repeat the same process with the leaves and tape beneath the petals. Place a small bowl filled with jelly bean in the centre. Center a small glass vase (or a juice glass) inside a larger one. 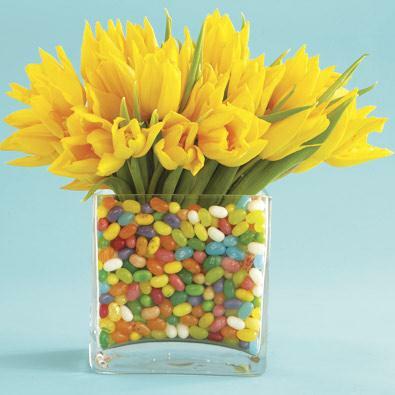 Fill the space in between the two vases with an assortment of brightly coloured jelly beans. Pour a few inches of water into the inner vase, then set your blooms in place. I made this centerpiece last year and used yellow silk tulips. After the holidays, I wrapped it in plastic and stored it on a shelf – and I have a ready to place centerpiece this year! Enjoy your holidays and send in your comments, suggestions and experiences – your input is always welcomed and very much appreciated!